Just came across some old notes I used to use for entertaining diversions in Pre-calc a dozen or so years ago. My notes say I got these ideas from something by Richard Guy (I know that leaves it pretty loose) that was also related to Friezes in math, but I only used a small bit of what they said on that. They showed that if you start with a row of zeros, follow with a row of zeros on the second row, and add particular types of periodic sequences in the next row, you can continue to construct more rows by filling in with the unimodular rule. For example if we pick something as simple as 13122 we can continue to apply the unimodular rule in each new row, and eventually we are forced by to another row of ones with a row of zeros below it. 0 0 0 0 0 0 0 0 0 …. 1 1 1 1 1 1 1 1 1 1 …. Our next row would have to start with 2, since 3*1-1*D = 1 solves for 2. Notice that we are (in this simple case) repeating the previous sequence translated to the right a bit. The next lines as you should see, forces all terms to be ones, and the final line produces all zeros. Here is an example I believe I got from the original paper. This was has been sectioned to illustrate the fact that these friezes also have a glide reflection element in the pattern. And now the pretty part; but before you proceed you might try to pick a four to six digit sequence to see if it works. Some do, but some don’t. OK, ready to go on? The pretty part about this experience is that there is an easy, geometric way to find sequences of any length that you want and they work, They ALWAYS work . My notes say this part was a contribution from that great Geometrician, John Conway, a frequent collaborator with Guy. 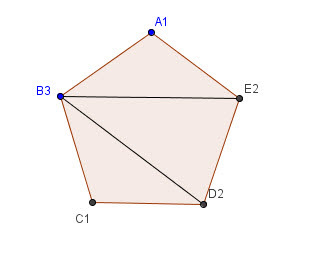 The Geometry is based on triangulations of a polygon. My sequence above, 1 3 1 2 2 , is based on a triangulation of a pentagon. You simply draw a polygon and construct diagonals in it to divide it into triangles. Then walk around the vertices of the triangle and count the number of triangles that contain that vertex. The numbers you get in order around the vertices consist of a sequence of n numbers (the same as the number of vertices in your n-gon) that are a working sequence in creating a frieze pattern. And that, in my mind, is a neat and unexpected connection. If it counts triangulations of a convex polygon, then it works in the third row of the frieze, and if it works in the frieze, it is the triangulation of a convex polygon. I have no idea how John Conway may have made the connection between these two seemingly different mathematical objects, but love the result. The number of rows in your frieze is always one more than the n of your n-gon.